Showing Solidarity is the answer! The Tigray People Liberation Front’s (TPLF) master plan that was designed without people participation has faced strong opposition in Oromia region. For past several weeks, the vast majority Oromo students have displayed peaceful legitimate defiance to the plan. The TPLF’s agaize troops and local riot police reacted with full force. They opened fire on peaceful protestors committing killing, in discriminate beating, torturing and arresting in attempt to crash the protest. Despite to this horrific situation a series of anti-TPLF rallies has continued in several places. Calling to disban the master plan implementation, to stop the ongoing land grab policy immediately, a transition to democracy and end to tyrannical single tribal rule are some of their demand. The regime brutality response to unarmed protestors shall be condemned by all freedom loving people. Regrettably, during this time some elements of diaspora community are occupied in different mission. As seen on social media they are busy in injecting anti Ethiopia unity rhetoric to misguide the protestor’s goals. The participants of this on line activities, they claim to be from “Oromo origin”. They have been engaging in one ethnocentric sentiment spreading hatred to other ethnic group rather supporting the current protest in a solidarity sprit. Are they the regime agents working hard to break the momentum of the protest or bunch of hardliner fanatics advocating ethnic ideology as answer for Ethiopia political problem? Are they using this opportunities to reap the benefits from student protest? If their messages are unchecked, it is a threat for solidarity and freedom of Ethiopian people. The peaceful majority cannot afford to sit back and let it happen. Who can forget the crime committed by TPLF’s ethnic policy in displacement of several people due to their ethnic origin from several places in the past 24 years? We must pay attention to these very few fanatic people that are systematically poising the current protest in the name of ethnic rights. We should not allow their intention to expand. The responsible free media and Ethiopian elites should continue providing clear views on ethnic rights and Ethiopia nationalism. At this critical time any attempt to exploit the current defiance by hard liner of tribal proponent to rise to power must be rejected. Regardless our ethnic origin we should align with the protestors and show our outrage on the going brutalities. The focus must be to bring an end to ethnic based ruling regime from power. No one wants to see a repeat of the TPLF’s regime ethnic policy by its successor. The tribal elite campaign on line could pose trouble as they become an instrument of hate to other ethnic groups. 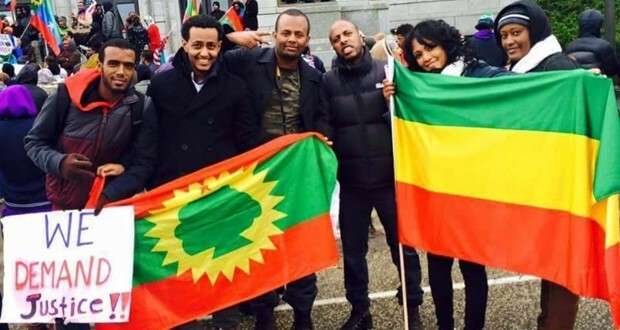 Even more intriguing as they are attempting to rewrite the Ethiopian history, censuring Ethiopian flag on protest sites, exchange slurs etc…Ethiopian flag is a symbol of freedom, hope and unity to all Ethiopian people. It is a pride and honor to have a national flag. If the hardliner grip to the state power, they may be more ruthless than TPLF regime. They will be accomplices of TPLF’s tribal policy. Their deconstruction approach to divide Ethiopia must be exposed and condemned. It is clear that these Oromo hardliner don’t speak for the majority. The majority is looking for genuine democracy, liberty and social justice for all. We should fight for interest of the oppressed mass of Ethiopia people. Tribalism should have no place in the country. Many of us we are dismayed and appalled as we see the ethnic rights principle is used as camouflage to distort the current protest. Oromo people are oppressed like the rest of ethnic groups with tyranny rule. The TPLF troops are cracking down and committing mercilessly killing of young boys, girls, and peaceful by standers. It is a desperate attempt to brutally crash the protest and same time terrorize the public at large. This action is similar to the red terror dark period of Ethiopia history. At this horrific situation, it is important for us to stand together with the protestors. It is no brainer encouraging narrow ethnic politics will further cements TPLF grip in power. Ethnic based extreme ideology brings nothing and will have no positive impact for the society peace and progress. Addis Ababa University students and the recent protest at Washington, D.C. area have demonstrated solidarity and should be encourage and joined by all freedom loving people. It is a fact that the opposition parties at home are prevented to have solidarity rally with protestors. TPLF’S policy has being played out the ethnic division rule the past 25 years. That is enough experience. Let speak out with one voice against divide and rule TPLF’S policy. It is unfortunate to see TPLF’S tribalism policy ruining our beloved motherland. Unless it is countered by pro-democratic forces, it is bound to more tragic event. What we wish to see is all inclusive voice and then to turn around the defiance to lead it to de facto freedom. We should not only support the protest but also agitate for freedom, equality, and unity among Ethiopian people. The on line media should be used to galvanize the aspiration and interest of Ethiopian public opinion. We must learn from TPLF failed policy to prevent the rise of another version TPLF rule.